It is time for promotion. Get noticed as a leader within your organization, fast! You are probably looking for opportunities to make more money, achieve greater levels of success, make a difference with your life, and get recognized as a leader within your organization. To accomplish these goals, you need to get noticed as someone with great leadership qualities. By developing absolute stand out leadership habits, you can get noticed because leaders recognize leaders. The whole world is desperately looking for leadership. One reason is that businesses start but fail at shocking rates. Statistics report that over 55 percent of all new businesses fail within the first five years. That is terrible news, but it gets even worse because 71 percent fail during the next five years. Part of this massive failure to succeed is due to a lack of quality leadership. This means that business owners and industry leaders are urgently looking for quality people like you. All you need to do is help them find you. Before that can happen, however, you need to stand out from everybody else. There has to be something different, something unequaled, and something noticeable about you. You need to become a standout leader. It is your difference that will get you noticed! Throughout this material, we centered on empowering you with information that would add value to your life and the organization you work. We knew that stand out leadership begins and ends with value creation. This means we had to focus on making people’s lives better through leadership training and self-improvement. Through study and practice, you can build a positive reputation based on sound leadership habits that offer great value for your organization. These leadership habits will help you stand out and get noticed, but more importantly, help you become a better person with something positive to add to society. Business success depends on many things such as a fantastic product or service, a great delivery process, outstanding management, and, of course, quality people. These ingredients make up part of the business model, but even with a terrific business model an organization can never advance without great leadership. This is where you come in. Leaders are thinking, intelligent, creative, and responsible people. Practicing stand out leadership habits presented here is guaranteed to help you get noticed. Let’s get started! Stand Out Leadership Training online training course includes 18 class lessons, audio teachings, reading assignments, and online quizzes that monitor your progress and understanding of each lesson. Winning the battle for attention. Vision is the ability to see the unseen. Every great cause, idea, product, and invention started in the heart of someone. People will only follow you so far. All leaders need to know "why" people follow them. Learn to increase commitment beyond your title through influence, motivation, trust, shared values, significance, and leadership by design. Credibility encourages others to follow you. Standout leaders have credibility indicators that attract positive attention and provide proof of worthiness to lead others. One of the fastest ways to get noticed is having the ability to solve problems. Those that solve problems are the most valuable within any organization. Solving problems adds value. Discover the eight steps of problem solving. Those in your organization that can advance you up the ranks are watching for certain habits that you bring to the organization. One of them is the habit of following through on assignments.Learn how to increase your credibility and reach the next level. The most productive are masters in time management. As you master the use of your time, you increase productivity and get noticed. This lesson includes character mapping, decision making, and moral excellence in leadership. Standout leaders put tools in the hands of the productive. Explore the wonders of the Pareto Principle, empowering others, achieving more with less, and the power of thinking ahead. When you plan well, you can make a difference in the life of others. Adding value to others is the way to personal success, wealth building, and fulfillment. Learn the eight benefits of proper planning and the positive actions that people admire in the leaders they follow. Habits determine your future. A habit is something you do every day, and what you do every day, you will do tommorrow. Learn to develope successful routines and the seven steps for positive change. Values reveal why you get frustrated, what you are passionate about, what's important to you, and what makes you tick as a person. Values guide behavior. Every relationship, team, or organizatin is built around shared values. Values guide every decision you will make in life and define the road you will travel. In this lesson we review the importance of inspecting what you expect, reaching the next level of competence, building a climate of trust, knowing when to move on, and the dangers of the Peter Principle. This lesson looks into team building, working with others, matching gifts and tasks, strategic focus, and working smart. Discover the power of "click", seeing what others don't, working to win, and the wealth within. Effective communication and having the right meetings can significantly reduce conflict and empower your team for higher levels of performance and excellence. Understand the power of professionalizing conflict, the four pillars of team meetings, roles, expectations, and procedures, and three different types of meetings. Continual training is a vital component within every organization. Stand out leaders understand that training cannot be optional but deliverate for learning new skills and developing positive behaviors that reflect the culture of the organization. This lesson includes 18 recruiting suggestions. God has hidden his wisdom in everyone. This means that no one of us is smarter than all of us. This lesson includes an overview of finding wisdom, the many membered team, everyone matters, and the 12 traits of team building. Presentation is eighty percent of acceptance. People see you before they hear you. Presentation is remembered. Learn about encounters and enviroments, supporting props, everythig speaks, encounters and people, and 7 steps for great presentations. Mission and shared values creates culture. Mission statements are used to explain an organization's purpose for being. They provide clear expectations when clearly communicated, understood, and agreed on. This lesson looks at several examples that will help you develop a mission statement that supports a powerful culture of shared values. This is a collection of leadership sayings worth meditating on. 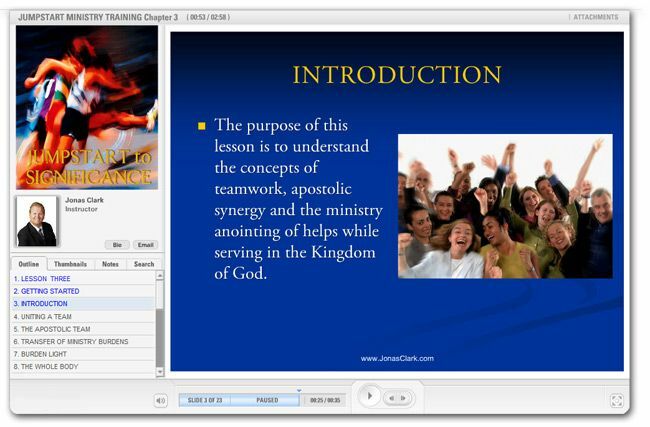 Receive an A. E. I. ministry training certificate suitable for framing after completing the course.